I've been reading a ton on social media and effective blogging lately. This guy says this and this lady says that. There's so much information out there it can be a little overwhelming. It's been great to connect with people from all over the world through blogging, linkedIn, twitter and any other crazy thing I've signed up for. Meeting all these different people has given way to new knowledge. It's been great, but in the end all the twittering, facebooking and blogging has to mean something, right? Well, I really thought about this blog and I realized that as much as I love what social media and blogging offers, it really comes down to what we can offer others through those outlets. 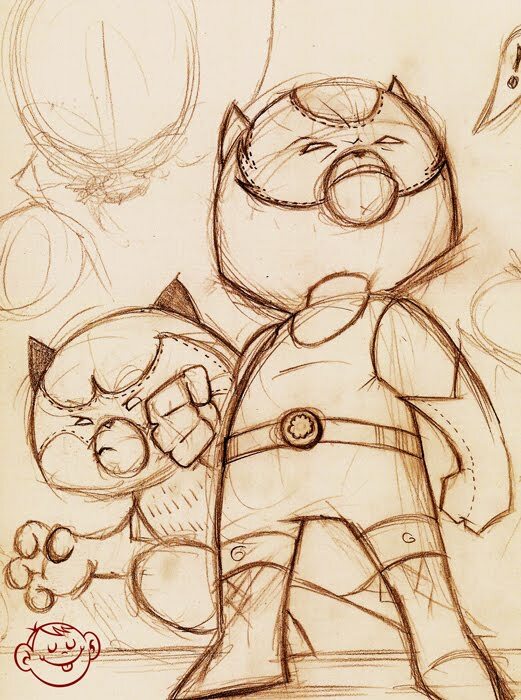 When I was a kid all I wanted to do was draw cartoons and animate the best shorts. Well, things didn't turn out exactly like that, but this blog helped me to get back to my roots. After being a professional graphic designer for 11 years I've really appreciated looking back and being that kid again. Sharing works in progress, designing new characters and sharing them and their stories is the best part of my day -- and I don't get paid for it! 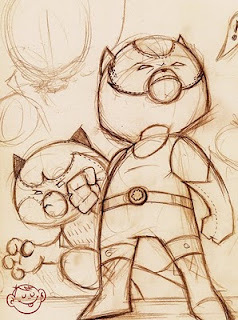 Who gets to say sketching a cat and a raccoon in luchador masks makes them happy? So in the end this blog has been a huge gift to my growth and all I want to do is share the fun with everyone else. Sometimes we just need to do something because we love it and because it makes others happy. It can change your life. P.S. This sketch makes me happy! Isn't that always the way. You love what you can't get paid for? But then its really not about the money. Money just complicates things. I really like these charcaters. It would make a great show on Nick. I really love your characters. And your right about doing something for the love of it. It really can change your life. Not many people have these kinds of outlets. Keep on growing, that's what life's all about! And if blogging does the trick, all the better. Anyway, seriously we learn a lot by blogging and the comments we get. Not to mention that we get to know interesting people that we truly enjoy interacting with. Absolutely. The web gave way to the information age, but to me its given people a new way to connect with people who you would normally never get to meet. That is valuable by itself. I appreciate your candid thoughts and agree that blogs can change our lives. That is... if we keep our minds and hearts open. After I took the blogging course "Become a Blogging Maniac" I told Bea Fields, the instructor, that it was a "life changing experience." And she's using it as a testimonial on her site -- with my thanks because blogging has changed my life -- inducting me into the blogosphere and helping me to meet many, many new friends and business colleagues. @Keyuri thank you. I believe you're right. There is a level of trust that you give people who are honest and open minded. Sometimes I feel it's the only way to do business in this economy. @Jeannette That's a great story. I'm going to look that up. Dennis, your drawings and posts have also given your readers something to enjoy which not all do, so thank you. @Susan My pleasure. I think I'm a born entertainer. I love to tell stories and this is just another way of doing so. I appreciate your blog as well, Susan. I'm learning a ton reading your posts and tweets. Well your are doing a great job. I love coming to your site. It is such a pleasure. I have several artists I like to follow on a regular basis. Actually I believe that imagination and art are the bottom line. Thanks for all of the enjoyment.